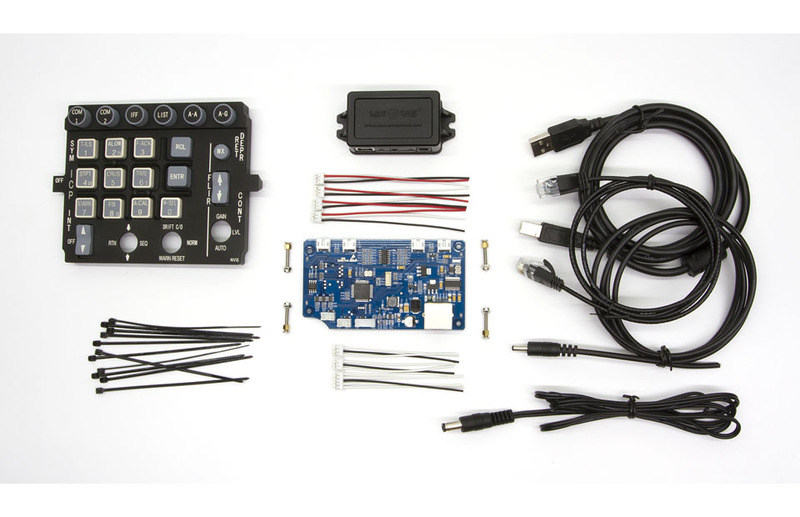 This ICP is built as a USB Plug-n-Play game controller. It has 19 buttons and 2 rocker switches on the front panel. The ingraved symbols on the panel, buttons and rockers are back lit with full color LEDs. Apart from the front panel, the main controller board also accepts a DCS switch, 2 toggle switches and 4 thumwheels (sourced separately) as peripheral inputs. The profile of this product is kept at minimum by utilizing a breakout box which helps fan out the USB cable and two external power supplies through an ultra-thin RJ45 cable. Color and brightness of the backlight is adjustable from either an external voltage soure or the new RSW Console software. Which also allows advanced configurations with the thumbwheels, the toggles and DCS switches. The software currently supports shared memory of Falcon BMS and it's capable of detecting mission start in the game. All the buttons and switches work perfectly well with Falcon BMS, DCS World and most other games which support DirectX. Future support for in-game synchronized backlight dimming will be available once Falcon BMS starts providing backlight data through shared memory, or DCS F-16 becomes available. The functionality has already been built into the hardware, all it takes is an upgrade of the RSW Console software. Note:Thumbwheels, the DCS switch and the toggle switches are NOT included in this package.